Plymothian Transit: First National Express? First Devon and Cornwall are loosing some of their National Express work. 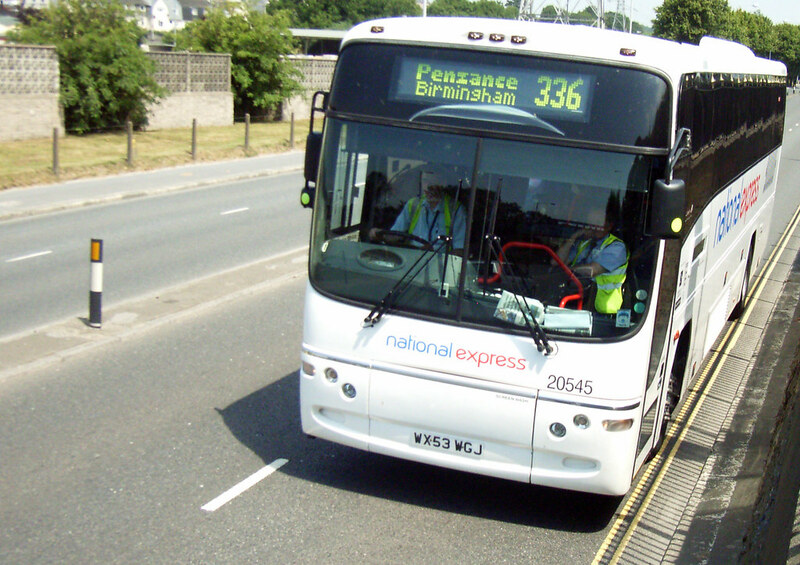 The North Devon National Express contracts were due to transfer to Hookways this week, although this date has been put back to 26th July. By pure coincidence it has just been announced this week that First had made an approach to take over National Express, an offer which has been declined, for now at least. Martin Gilbert, First’s chairman, made the offer in a letter sent to the home of John Devaney, his opposite number at National Express, last week. It arrived a day after the breakdown of talks between National Express and the Government aimed at resolving a long-running, multimillion-pound dispute over services on the East Coast Main Line. To succeed, Mr Gilbert and Sir Moir Lockhead, his chief executive, will not only have to win over National Express shareholders but also competition watchdogs. Merger speculation in the transport industry — which is dominated by a handful of large, quoted groups with their roots in the Conservatives’ deregulation of municipal bus services and the privatisation of British Rail, first under Margaret Thatcher and then John Major — has often been scotched by the belief by industry leaders that further concentration of ownership would be blocked by the Office of Fair Trading. First will argue that train and bus contracts are now so prescriptive that little freedom in setting fares, timetables and even choice of rolling stock is allowed to operators and that normal competition rules should not apply. National Express confirmed that it had rebuffed an approach from its rival to create a powerful force in the public transport industry through an all-share transaction. The company said it "does not consider it appropriate" to enter into talks with FirstGroup while it attempts to whittle down a £1.2bn debt burden and deal with its east coast franchise, which must pay the government £1.4bn by 2015. FirstGroup, owner of four franchises, including First Great Western, said it believed there was "significant industrial and commercial logic" in a deal. The combined group would carry more than 1.4 billion bus passengers and 409 million rail passengers in the UK a year. One man who will be hoping that FirstGroup launches a hostile bid for rival transport group National Express is Lord Adonis, the Transport minister, for whom such a deal might just be a golden opportunity to wriggle off a difficult political hook. In public, the Department for Transport has given the impression that it will not compromise with National Express over the terms of its under-performing East Coast Main Line franchise. In private, however, Lord Adonis knows he has a problem. National Express may have no one but itself to blame for the predicament in which it finds itself over the East Coast, but the parlous state of its finances means it does need a deal. However, were National Express to come under new ownership, Lord Adonis might find it easier to come to some sort of accommodation on this issue. One could imagine him justifying some sort of relaxation of the terms of the East Coast franchise if he could say, in the same breath, that the management responsible for getting National Express into its pickle had departed. There would be some competition issues to wrestle with, because the combination of FirstGroup and National Express would have a stranglehold on certain types of service, particularly commuter journeys into London. Still, this too might present Lord Adonis with a PR opportunity: if he were able to force the combined group to give up certain franchises, he could argue that further sanctions had been imposed in return for an East Coast deal. Many people will be watching what National Express does next!